Bicycling is probably the 2nd most popular activity in Stanley Park after walking. You can bicycle completely around Stanley Park on the Stanley Park seawall which is 9 kilometres. 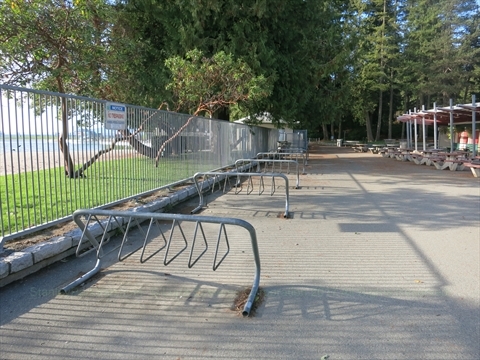 The Stanley Park Seawall has a separated one-way (counter-clockwise) lane for bicycles. The speed limit is 15km. Please don't speed because a number of pedestrians have been hit and serious hurt and killed by bicyclists! The Vancouver Parks Board has a cycling plan for Stanley Park: Stanley Park Cycling Plan. 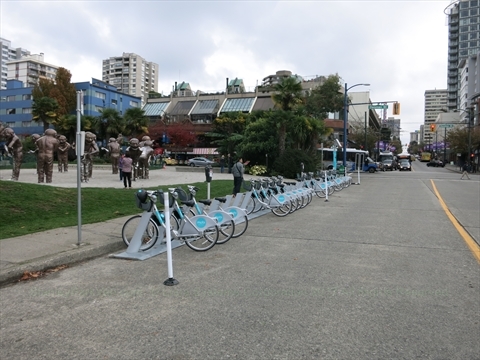 You can rent the city-funded Bike share bicycles in a few locations within Stanley Park. For more freedom, you can rent a bike from one of the many full-service bike rental shops just outside of Stanley Park. In June 2017, the city of Vancouver installed five Mobi Bicycle stations in Stanley Park. Mobi is the city supported bicycle sharing program. These stations are at the Vancouver Aquarium , Totem Poles, Information Booth, and 2 stations at Second Beach. In 2017, 24 Hour passes are Cdn $9.75(plus overage fees) for unlimited 30 minute rides. 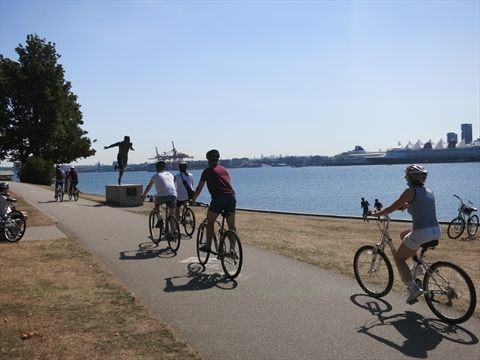 Where can you bicycle in Stanley Park? Most people bicycle on the Stanley Park Seawall around Stanley Park. There is a decidated lane for bicycles, skateboarders, roller skaters, and roller bladers. Bicycling is also permitted on a number of the trails within Stanley Park. The main trails that allow bicyling are: Prospect Point Trail, Rawlings Trail, Lovers Walk, Bridle Path, Avison Trail, Hanson Trail, and Beaver Lake Trail. These paths are primarily crushed gravel and vary in grade. A number of people commute to North Vancouver via the Stanley Park Causeway. After some fatal accidents, the province is currently upgrading the sidewalk to better accomodate both cyclists and pedestrians. Is the Seawall path flat? The seawall is relatively flat. There is a slight incline from Hallelujah Point to Brockton Point Lighthouse. Is the Seawall path paved? Yes, the seawall path is paved. How long does it take to bicycle the entire Stanley Park Seawall? It takes about 1 to 1.5 hours to casually bicycle the entire seawall. Yes, helmets are mandatory. Many days, the seawall is very busy with pedestrians and bicycles so it can be dangerous if there are collisions.